Recycling is easy and accessible throughout the SCISWA planning area. Keep in mind that disposal options listed on this site may change for certain items according to location or recycling markets, and sometimes the safest and best disposal option is still the landfill. Did you know you can bring your residential recycling to the landfill or transfer station? Landfill–Recycling is collected at the convenience center behind the scale house. Material must be loose (not bagged) and does not have to be sorted. Accepted items include paper, cardboard, plastics #1–#7, and tin or aluminum cans. Large volumes of cardboard can be recycled in the carport next to the recycling drop-off. Plastic bags and glass are not accepted. 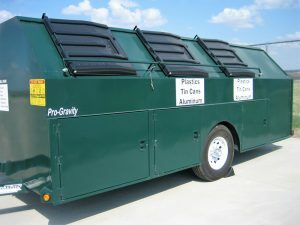 Transfer Station–Recycling is collected in a trailer adjacent to the scale house and transfer station office. Material must be loose and sorted. Accepted items include paper, cardboard, plastics #1–#7, and tin or aluminum cans. Plastic bags and glass are not accepted. Check the Recycling page for information on how to recycle common items or see the Community Guide for details on how and what you can recycle in your community.